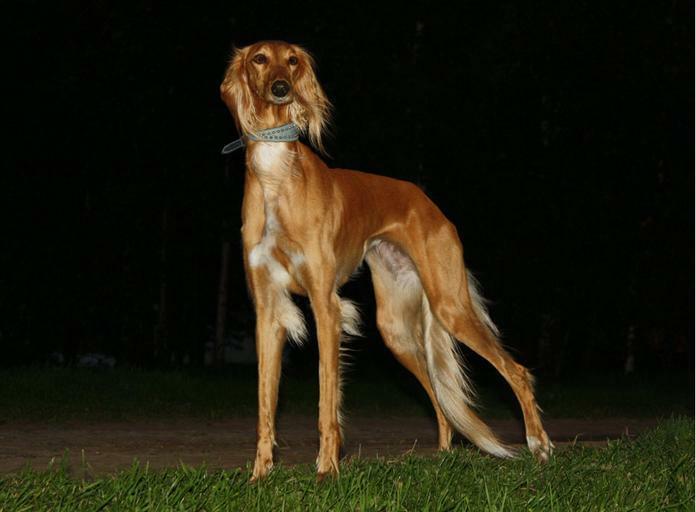 An ancient hound from the Middle East, the Saluki temperament is reserved, intelligent, and aloof. The Saluki breed is so ancient, images have been found at archaeological sites. Recent evidence shows depictions of Saluki dog pictures on Egyptian tomb in 2100 B.C.E (about 4,000 years ago). They were even mummified after death in Egypt. Once called the Persian Greyhound or gazelle hound, Pharaohs would hunt gazelles and hares with their Salukis. Today, they are quiet and loyal companions. Saluki dogs are known for their aloof personality, but they are very devoted to their family. Salukis tend to form a bond with one family member. When that family member is gone, Salukis can suffer from separation anxiety. Like cats, Salukis are picky about personal cleanliness. They love to be comfortable – preferring soft bedding and a couch to lay on over the floor. Salukis are so devoted to their family that they tend to shy away from strangers – especially if they are not socialized properly. Despite the reserve they show towards strangers, Salukis do well in a home with older children. Young children, on the other hand, can often be too rowdy for Salukis. They do get along with other dogs but prefer other Salukis to different breeds. Salukis will not chase small dogs or cats in their home, but other small animals (like hamsters or rabbits) are too tempting. Although quiet indoors, Salukis do need to run. They are better suited for a home with a large, secure fenced yard. The Saluki is sensitive and can pick up on emotions. Their intuitive nature causes them to be stressed when there is tension in the home. A Saluki is not the right dog for you if you want easy obedience and complete adoration. While they can be trained using positive training methods, they prefer to do it at their own speed. Salukis don’t, however, do much wrong – aside from digging. They are not excessive pullers, they don’t bark a lot, and they are not a hyperactive breed. Salukis will benefit from obedience training at a young age. Use positive reinforcement like treats and praise. Do not use negative training methods on the sensitive Saluki. They think for themselves and sometimes they prefer to do something more interesting to them than training. If you don’t make training a fun and positive experience, they are perfectly fine ignoring you. Are you ready to add a Saluki to your family? Your first task is deciding whether you’d like a Saluki dog for sale from a breeder or a rescue organization. 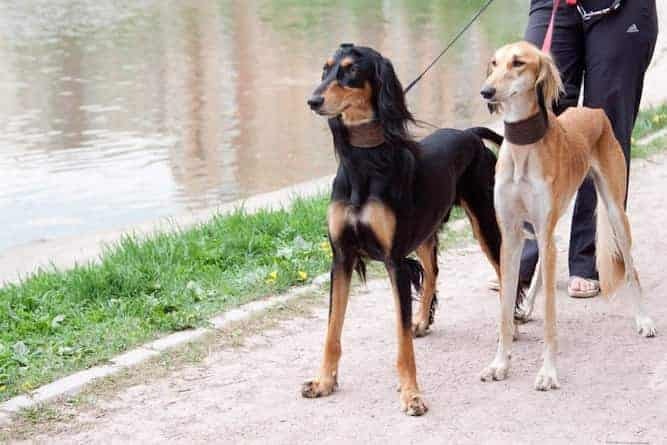 The Saluki Club of America is a great place to start when deciding whether to purchase one from a breeder or adopt from a rescue organization. Take your lifestyle into consideration when deciding between buying from a breeder or adopting from a shelter. Buying a puppy from a breeder is time-consuming and requires a lot of patience. If you don’t have time for a puppy, adopting a Saluki may be the better option. Saluki puppies for sale will cost between $600-$800. The Saluki dog price depends on litter availability, breeder location, and lineage. A Saluki for sale from a top breed line will cost $800 or more. Expect to pay between $200 and $400 for a rescue Saluki, depending on the location and organization. The Saluki Tree of Life Alliance, Inc. is a great resource for Saluki rescue. 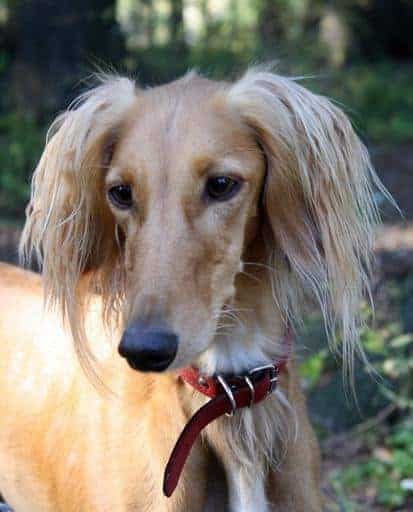 You will find information on Saluki adoption as well as dogs available for adoption. An adoption is a great option for families looking for an adult Saluki or a Saluki mix. If you’d rather purchase a Saluki from a breeder, check out the AKC Marketplace. You can search Saluki breeders based on location, pedigree, and whether they have litters available or coming soon. 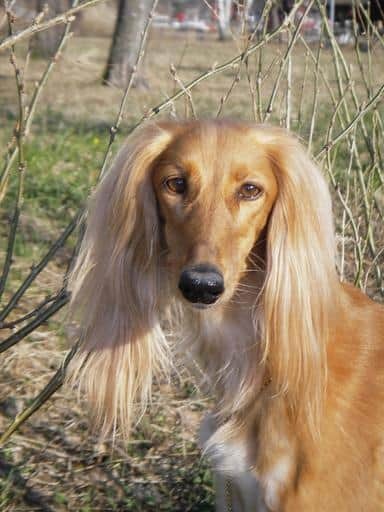 Saluki dog breeders should be knowledgeable about the Saluki breed. They should be able to answer any questions and ask you questions in return to determine if a Saluki is right for you. The best breeders will provide health certificates and make you aware of any known temperament issues with their litter. Make sure to take your time researching and meeting with breeders to find the perfect one. The Saluki dog weighs between 40-65 pounds and between 23-28 inches tall. They have a life expectancy of 10-17 years. 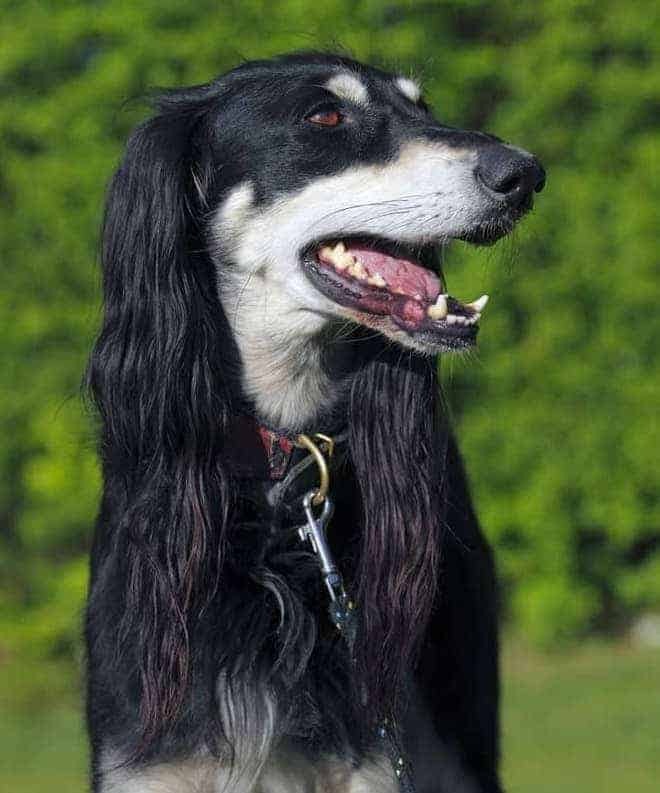 Salukis have a short, silky, and smooth coat. Their entire body can be smooth or have slight feathering on their legs, back on the thighs, and shoulders. Silky hair coats their long ears. They come in cream, white, fawn, golden, grizzle and tan, tricolor (black, white, and tan), and black and tan. Salukis are low-shedders and odorless. They need weekly brushing to remove dead hair and distribute oils. Comb their feathering one to two times per week to remove any tangles. Bathe your Saluki only when necessary. The Ultimate Guide to Dog Health is a great companion resource that will help ensure your Sulaki remains in tip-tip shape. Get your copy today. Salukis do require a moderate amount of exercise to stay fit and healthy. They require daily (leashed) walks or runs in a large, fenced yard. They also do well in dog sports such as agility and luring. 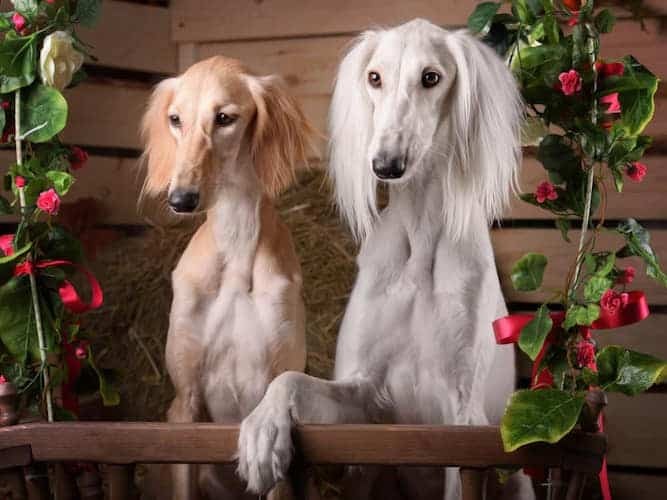 Although the Saluki is known for being aloof and quiet, they are completely devoted to their family. This highly active breed is best suited for active families who have the time to exercise their Saluki. They do not do well in apartments and will thrive in a home with a large, fenced-in yard. Salukis are good with children and other dogs – though they prefer other Salukis to different breeds. They are intelligent but like to think for themselves and can be challenging to train. If you are looking for a quiet, gentle dog who adores their family, the Saluki will make the perfect companion.